Letter to Book ‘Em. Photo Credit: Book ‘Em Facebook Page. Click here to read the text of the letter. Attention book lovers! Book ‘Em is a Pittsburgh non-profit that needs your help to send books to prisoners in Pennsylvania. I spent a few hours yesterday in the basement of a building on Penn Avenue yesterday with a group of volunteers who were picking out books and packing them up to be sent to prisoners across the state. I had no idea that the basement below the Thomas Merton Center was set up as a little book-shop by mail. If you love browsing book stores and picking out books then this is the volunteer opportunity for you! 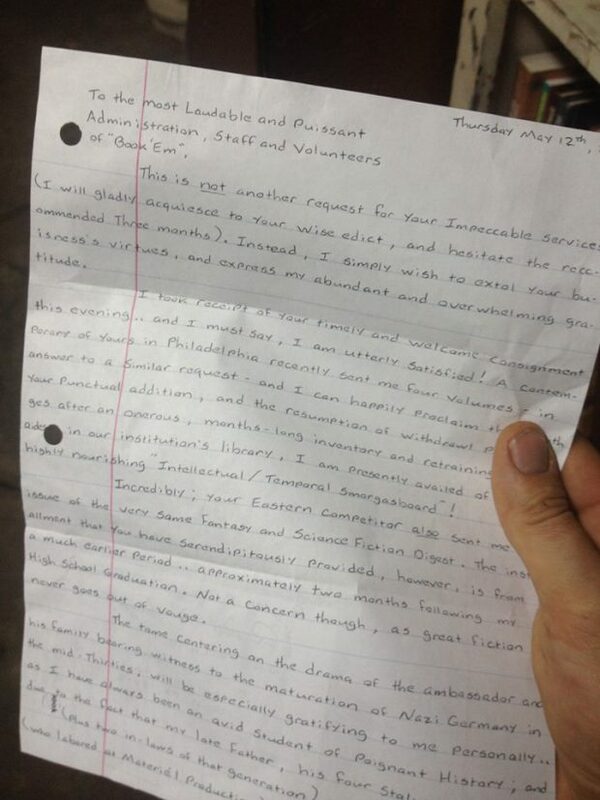 Prisoners from across the state can write in and request books. Some requests are specific, most are for general categories of books. I love browsing bookstores, but I have promised myself I will not buy any new books until I’ve read the ever growing pile of books in my house. Fulfilling each request was a challenge of browsing the Book ‘Em bookshelves and make a best guess at what each person might like to read. Many of the requests that I filled yesterday were for educational books. If you have books to donate please check the list of requested books here. Book’Em’s biggest need is money to cover the cost of shipping books. If you want to help with the cause, please consider sending a few dollars to Book ‘Em via the donation page here. Paper Bags! Book ‘Em wants your empty paper bags. Instead of throwing out paper grocery bags, please donate them to Book ‘Em to be used for wrapping up books to be mailed. Volunteer! Volunteers are needed to help pick out books and pack them for shipping. You can see a calendar of volunteer days here. Books and paper bags can be dropped off at the Thomas Merton Center, 5129 Penn Ave, Monday through Friday from 10 to 4 and during our Sunday work sessions. « How would you design your perfect Pittsburgh summer?